As ever, there was a backup system for the PGNS, although in this case the philosophy was a little unusual because it was not meant to replace the PGNS in the event of failure in order to allow the mission to continue. As its name, the abort guidance system (AGS - pronounced 'aggs') indicates, it was intended to be used for an abort. Designers were worried about the PGNS failing while the two men were descending to the rocky surface of a hostile world. This was a reasonable concern, as its systems were complex, exotic and very new. They decided, therefore, that if the PGNS did fail, the descent to the surface should simply be aborted, the descent stage jettisoned and the ascent stage fire its engine to return to orbit. To achieve this, they added a separate guidance system, the abort electronics assembly, which had a simple computer, the AGS, at its heart. Instead of having its own heavy IMU, the AGS received its attitude reference from a set of strapped-down gyros and accelerometers. These were intrinsically less accurate and more prone to drift than a full IMU, but they would only be required for a short period of the abort. 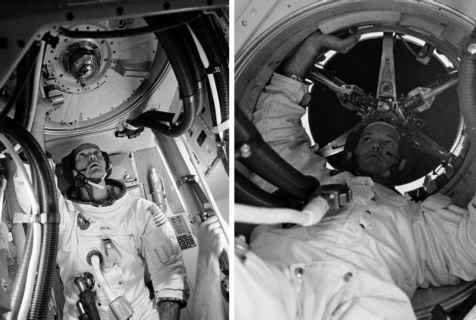 Throughout a normal descent, the lunar module pilot closely monitored the AGS to ensure that its knowledge of velocity and position kept track of the PGNS. At regular intervals, he fed it updates from the more accurate system and then watched how the two compared. Then, if the crew lost the PGNS, the AGS was ready to take over and automatically guide them to a safe orbit, from which the CSM could rescue them. The LMP worked with the AGS using an interface that was even simpler than the DSKY. It had one single 5-digit display and a simplified keyboard. As it had little in the way of a user-friendly interface, he had to get down to its machine level to use it. To access its memory, he had to supply an address where a value was stored in a manner that will be familiar to those who used the very early microprocessor-based machines of the 1970s. In order to achieve high functionality, he had to understand it well and be slick at interrogating it. It could keep a LMP very busy. By Apollo 17, Jack Schmitt and the engineers he worked with on simulations had done so much with the AGS that they believed they could have used it to continue to a landing had the PGNS failed.